Nothing is more chic or timeless than WHITE ON WHITE in a bedroom. I grew up in a white bedroom and I can still remember the quality of light that came through my white curtains as the morning sun was rising. Using white in a room can make it have surprising depth - I use several shades of white to bring out the architectural details in a room, or I layer the space with strong forms in different tones and textures of white and then use some strong contrasts to outline and bring the white into focus. Also every room no matter what colors are being used can benefit from a touch of black. Some of my favourite whites I use are are from Benjamin Moore - Cloud White, Simply White, Ballet White, Designer White. Not every white is snow white. Try using: ivory, cream, antique white, and palest beige, blue and yellow. I like the way that Thomas Pheasant has treated this bedroom architecturally. The wrap around tufted low headboard creates a unified feeling to a room that has angled walls. Vincente Wolf is a master at juxtaposition. His signature element in all of his rooms is a large over sized mirror, usually resting on the floor. 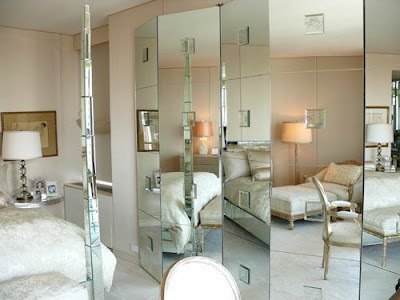 This is Nancy Corzine's very elegant bedroom. The mirrored screen creates a lively play of light and images. Super Luxe by Alberto Pinto. I like the layering of the padded headboard on a padded wall. This is a master bedroom that I did for a bachelor in Vancouver's historic Gastown. There are recessed sliding glass doors on each side of the bedroom to close it off from the dining room and the ensuite bathroom. Thats the one thing my fiance' and I agree on when it comes to interiors. A white bedroom is a must. I have never understood how people can crawl into a multicoloured bed room at night and fall asleep! Sublime. They are almost to perfect to sleep in. I particularly like the floor covering in that last picture. So many beautiful White bedrooms Patricia - I couldn't choose a favourite - Love the Vincente Wolfe one and Mimmi O'Connell - so classic, timeless, restful, beautiful, gorgeous!! Oh, and I'd love to see a submission from you in my ABT Christmas competition!!! LOL! I'm not a fan of white . 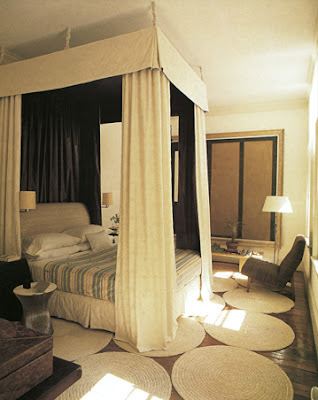 But these bedrooms look gorgeous !! I just adore a white bedroom. When I get confused about what I love in decor, or overwhelmed by colour choices, I always flip through my books and it's the quiet white simple bedrooms I always return to. 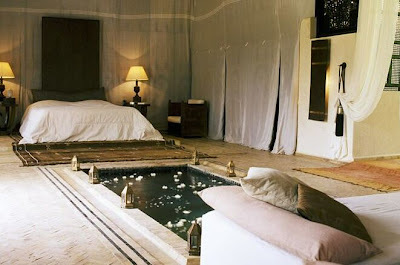 I just want to go to sleep in these gentle rooms! I have used Cloud White for trim and White Down for walls. But I want a nice warm white, or ivory perhaps, for my living room. It is a south-facing room, with sage green sofa, a rose rug, and walnut furniture (quite traditional). Can you suggest a nice ivory or warm white? I keep looking at the cards and they all start looking the same after a while. I don't want a blue or grey white, and not yellow. More a parchment or browned white (hence I am thinking ivory) perhaps...I am a little afraid to go pure white (like Cloud white). Any suggestions, since you know your whites!? Wow this is a really great post on white bedrooms! I really like the chairs you used to decorate the bachelor pad. They look really neat! I've always loved the layered look with cozy textures. Patricia, I just got my copy of House & Home in the mail today and saw you quoted! I agree wholeheartedly with the quality comment!! So nice to see your remarks. I said to my boyfriend "hey, I know her!!!" (as though we were great old friends!) Thank heaven for blogs, connecting us all, letting us inspire others in big and little ways! Beautiful and serene. I loved them all! What a beautiful post! 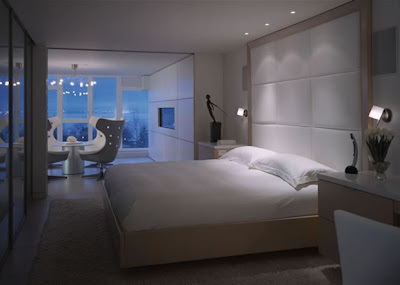 I love all white bedrooms. I also love all white kitchens! There is something so clean and crisp about all white done properly (all of these are stellar examples of rooms done properly!). 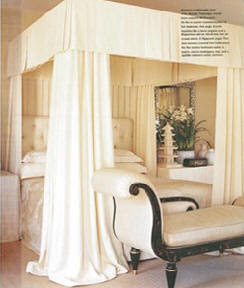 There is an all white bedroom featured in Domino (November '05) that started me thinking about redoing my own bedroom. Now I'm convinced! 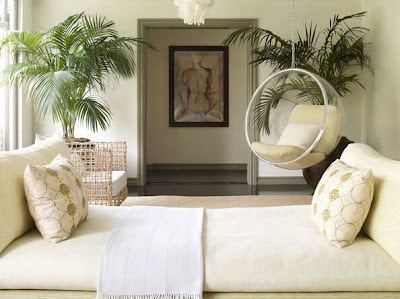 I have to say that white in a bedroom has to be my favorite, as a bedroom is for relaxation, and one doesn't need a room that is busy, a having a white room is just great as one can add color in the form of accessories, from paintings throws,scatter cushions etc. I am really loving visiting your blog, and all the information and creativeness that you share.